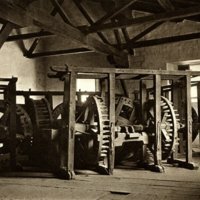 This photograph, from the 1920s, shows wooden machinery once used in the Casa de la Moneda. These devices, used to press the silver, were powered by mules harnessed to a vertical shaft in a chamber below. Roberto Gerstmann was an Austrian engineer and photographer who traveled across Bolivia in the late 1920s. His images depict miners at work in Potosí, indigenous residents of Bolivia and landscape views of the country. He also published photographs of Chile and Colombia. The scale of the Casa de la Moneda can be sensed from this image. This is one outbuilding, just partially filled with machines, each of which is over six feet in height. The photograph is a copper plate photogravure, a print made from a copper plate that has been etched with chemicals. This method of printing photographs became common in the 1890s-1920s. This photograph was published in the collection, Bolivia: 150 grabados en cobre, in Paris in 1928. 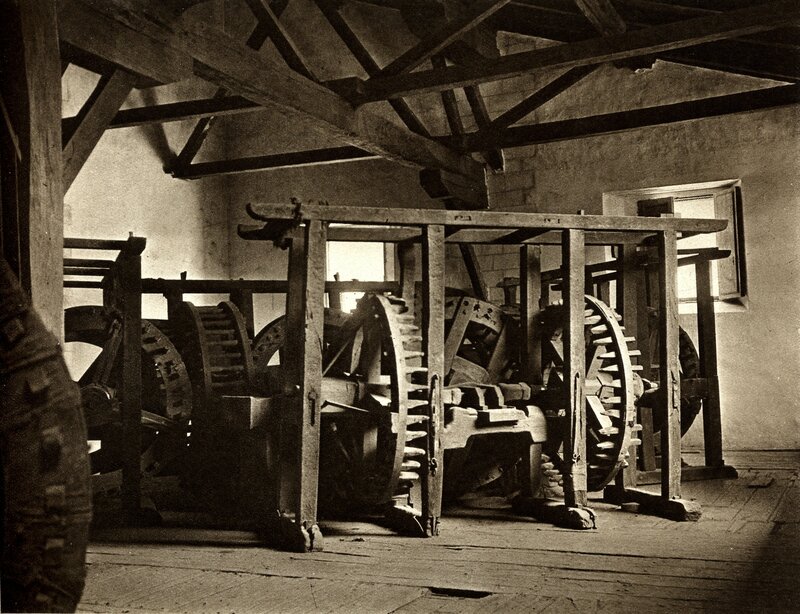 This photograph evokes the romance of the Casa de la Moneda, and its decaying state more poignantly than it does the labor of the people and animals who once worked these machines to work the silver into coin. Gerstmann, Roberto. 1928. Bolivia: 150 grabados en cobre. Paris, Braun and Co. Editores.